Gorraiz (Spain) (AFP) - On-form Frenchman Julian Alaphilippe burst to a hilltop win on stage 2 of the Tour of the Basque Country on Tuesday while overnight leader Maximilian Schachmann held on to the overall lead. On a hilly stage which featured several dirt road sections a select group of around 40 formed even before going up the final short climb with a tricky eight percent gradient. One man not in that group was Adam Yates, whose recent run of poor luck in finishing runner up twice in one-week tours, continued when the British climber lost 1min 10sec due to a puncture. 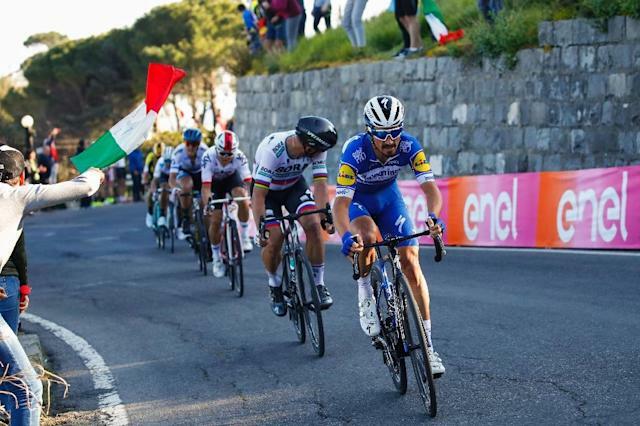 "The final, with a climb like this, was perfect for me I knew that Michel Kwiatkowski was strong, so I followed him," Alaphilippe explained after beating Bjorg Lambrecht and Sky's Kwiatkowski by a single second. "I'm really happy to take another win," added the one day specialist who won the Milan-San Remo classic two weeks ago. In another incident Alaphilippe said sorry after the race to Schachmann for clipping him in the final struggle for the stage win. Schachmann of the Bora-Hansgrohe team won the 11.2km opening day individual time trial and still holds an overall lead of five seconds on Alaphilippe. 1. Maximilian Schachmann (Ger-Bora) 03hrs 36mins 44sec, 2. Julian Alaphilippe (Fra-QST) at 05sec, 3. Michal Kwiatkowski (Pol-Sky) 10, 4. Daniel Martinez (Col-EF) 18, 5. Ion Izagirre (ESP-Ast) 23, 6. Patrick Konrad (Aut-Bora) 23, 7. Enric Mas (ESP-QST) 28, 8. Dylan Teuns (Bel-Bah) 36, 9. Daniel Martin (Irl-UAE) 39, 10. Emanuel Buchmann (Ger-Bora) 41.